The unfinished Building 8 in Base Village. It was once to be a Little Nell Snowmass and its future remain uncertain. Its foreclosure firmly in the rearview mirror, Base Village’s owners are taking small steps to restart the dormant project at the base of Snowmass ski area that it reclaimed from bankruptcy in September. Fueled with confidence — and cash ­— from the sale of 49 units between Dec. 2 and today in the Viceroy, Related plans to start work on the second building of luxury condos and an enhanced workout facility by next year. Dwayne Romero, president of Related Colorado, said the condos in 13A, finally untangled from litigation and bankruptcy, sold for an average of $877 per square foot. That’s a far cry from their pre-recession contract price of $1,725 per square foot but welcome in the current Snowmass Village market. “One piece of good news leads to the next step,” Romero said. The 67 ski-in, ski-out units in 13B will rise from a concrete pad, one of several faceless slabs in the Base Village neighborhood that are continuous reminders of the foreclosure. The minor planned-unit- development amendment that Related is asking for, a mix in the size and makeup of condos in Viceroy’s next phase, actually could amount to a major deal for the town. Construction on the second phase of the Viceroy is expected to bring residential development more in line with the amount of commercial square footage necessary to make Base Village viable. “In this pause (since the project stalled), there’s been an imbalance,” said Forrest, who is leaving the town government in August for a position in Gunnison County. Right now, just 35 to 40 percent of the dwelling units are complete, he said. That compares with “about 50,000 of the 70,000 square feet of commercial” finished space. Businesses have felt the imbalance; even stalwarts like Sneaky’s, an Aspen Skiing Co. restaurant in business since Base Village’s opening, couldn’t make it. First to bail from Base Village was the Sweet Life, an ice-cream parlor/candy store that looked to be the perfect business for a family resort. After three winter seasons, owner Jennifer Hayes closed her doors in the red barn and returned to Telluride. Among Snowmass’ tri-nodal commercial districts, Base Village finished dead last in sales per square foot, behind both the (newly spiffed-up) Snowmass Center and the Snowmass Mall. Forrest said sales in Base Village were below $200 per square foot, indicating weak performance. Town Finance Director Marianne Rakowski said she couldn’t confirm that figure as the survey still is under way. While it’s still better than plastic flapping in the breeze, as was true when the project first paused, any temporary comic relief offered by the fake building fronts has lost its appeal. 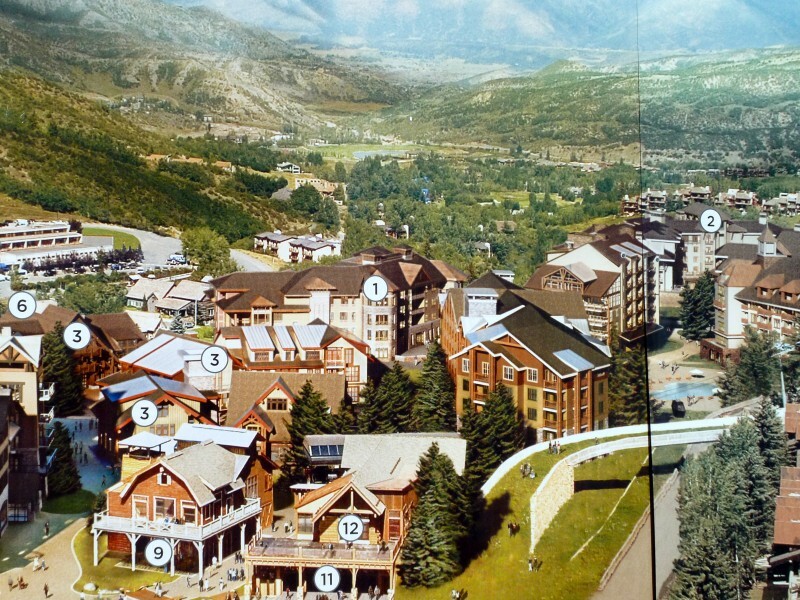 Building 8, once envisioned as the Snowmass Little Nell, is most egregious because of its proximity to the resort’s entrance. Tim Johnson, a Snowmass Village resident and hotel manager, said he wants the town to demand more accountability from the developer as it returns to the negotiating table. “I just feel the town has an obligation to stand up to Related or at least request they fix the exterior of that Disneyland-looking plaza and all. What an embarrassing base camp,” Johnson said. Related has made some circulation and interior changes to the transit center, but it still looks temporary. These kinds of frustrations might be aired during the planned-unit-development discussions, Mayor Bill Boineau said. In addition to dialogue about roadwork and Snowmass Water and Sanitation District mandates, “We’re going to have to have some larger, more complete discussions of the future of Base Village,” he said. The first topic that might be tackled is trust. Before a single new Viceroy unit can be built, Related must fix a sewer that has reached capacity. The director of water and sanitation, Kit Hamby, estimated the cost of the fix, which the developer would like to make during fall offseason, around $1 million. It involves tearing up Brush Creek Road and replacing water lines. “(Viceroy Building) 13B definitely affects that section of the sewer line,” Hamby said. Construction of a roundabout by the gas station, Town Hall and Carriage Way Road was mandated as part of the original Base Village approval, but its timing likely will be a negotiating tool between the town and developer, as will improvements to Wood Road. The Snowmass Conoco station sits at ground zero of the future roundabout, and owner Jeff Jandegian knows it’s been a messy corner for years. The intersection is really no picnic for the gas-delivery guys. “It’s scary coming out of the bottom (entrance),” Jandegian said. Overall, he and co-owner Jeff Head are happier guys these days, finally having bought the ground under which their retro filling station operates for $800,000 from Alpine Bank. Used as collateral for other Related WestPac purchases, the Conoco was wrapped up in the bankruptcy with so-called “toxic assets” that tangled other longtime business owners, including Mark Moebius, whose parents built some of Snowmass’ original hotels. Ordinance 21, series of 2004, granted planned-unit-development approval and established zoning-development parameters for the Base Village development. With a 10-year vesting set to expire in November 2014, Base Village could include 1 million square feet of development, including 611 residential units. Its original phasing was changed to permit the start of the Viceroy and included a public improvement, the bridge above the future roundabout. Within the approval is a gondola to link the Snowmass Center with a landing pad in Base Village, a transportation mitigation that might not ever get built. Pat Smith, a California developer who brought Related to Snowmass, currently is developing student housing in California and was the impetus behind bringing the Viceory to Snowmass. He’s not surprised it’s the gem of Base Village. “We had it right, and the town got their beloved Westin, anyway,” Smith said. When Aspen Skiing Co. sold the commercial space for $169 million to his Related WestPac partnership in 2007, it retained a few parcels: the three-level Treehouse kids’ center, the ticket office near the gondola and the coveted beachfront property known as the Fanny Hill Townhomes, where as many as 11 units may be built. Currently the most fake-looking structure in Base Village, Building 8, could have been a Little Nell. Skico let the long-term management license expire, the company’s Don Schuster said. Skico isn’t sitting by idly even if a Snowmass Nell isn’t in the plans. “We’re obviously very, very interested in Base Village. We’re continuing to have discussions with Related,” Schuster said. The Planning Commission also is not sitting idly on the sidelines. During its recent meeting with the developer, member Jim Gustafson reminded Romero that units in the Viceroy always were seen as “hot beds,” without large kitchens that invited holiday sit-down dinners and encouraged eating out. “We’re not growing kitchens and living areas at a massive scale. … These are not mini-McMansions,” he said. Just before review of the original Base Village application, then-Town Manager Gary Suiter was removed from his job by a new Town Council eager to find its guy. Mike Segrest was hired for the job. Earlier this month, Forrest announced that he was leaving his job as town manager, which opens the possibility that politics could play into the selection of his replacement. Both Segrest and Suiter are among the candidates being talked about for the interim post, sources confirmed. Newest Councilman Chris Jacobson noted that it’s not just the town manager’s job that will have to be filled but also the public-works director and marketing director. Two council seats and the mayor’s job are up in 2014, and approaching subsequent applications with a new Town Council “is extremely concerning” said Boineau, who is term-limited. Watchdog Jeff Tippett, who once led a referendum against the project he believed was at least one-third too big, said there are fewer risks now than during the original, protracted review process. When the town of Snowmass Village officially approved the planned-unit-development project for Base Village, it included 1.034 million square feet of residential and commercial space across 26 buildings (though the project’s plans clump some structures as being part of the same “building”). The official “buildings” shown on the plans are labeled as Buildings 1 through 13B. Of the slightly more than 1 million square feet of development, 844,123 square feet were designated for residential development — across 610 units — and 190,195 square feet were set aside for commercial space, according to a detailed report on the existing approvals prepared by Oz Architecture for Lowe Enterprises in January 2011. Major construction of the project began in March 2006 and lasted until November 2009, when the Viceroy hotel opened in Building 13A. Some relatively minor construction on the project has occurred since then to improve the exterior appearance of some unfinished buildings and to make a portion of Building 7 — the village’s central arrival building — functional. But other than that, Base Village construction has been on ice. The first phase of construction included the building of a large parking garage on which seven buildings sit. The garage has 626 parking spaces with 259 designated for commercial uses, 203 for day-skier parking and 164 spots for residential parking. Also completed between 2006 and 2009 was Building 1, known as the Hayden Lodge and home to the Treehouse children’s center. It has 48,843 square feet, with 22,500 square feet being residential units and 26,343 square feet of the space used for commercial purposes. 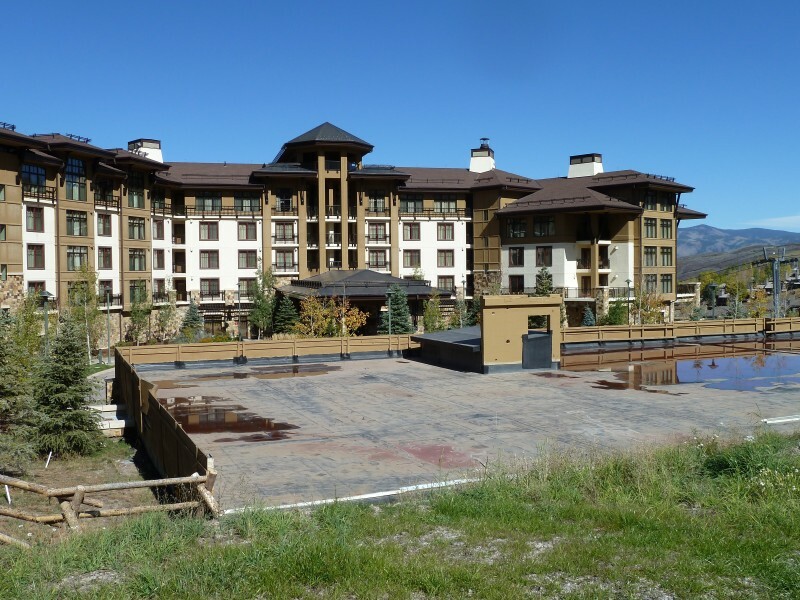 Buildings 2A, 2B and 2C — the three buildings that make up the Capitol Peak Lodge — also were completed. They total 146,343 square feet, with 107,729 square feet of the buildings’ space attributed to residential. The highest point of the highest building is 82.5 feet. Buildings 3A through 3E were completed and house the Base Camp restaurant, Aspen Skiing Co. ticket offices and Slice, Snowmass Bakery and Four Mountain Sports in the red-barn building. Collectively, they contain 24,669 square feet of space. And 13A, the Viceroy, was the last building finished before major construction stopped. It consists of 209,055 square feet of space and 152 condo/hotel rooms. From finished grade, its peak height is 97 feet. So what wasn’t finished? A lot. Work was suspended on Building 8, which was to open as The Little Nell Snowmass. Eighty-three feet tall, it was to contain 95,893 square feet of total space, with 27 luxury residential units — at an average size of 2,055 square feet — spread across 66,118 square feet. The building was to house a private mountain club with 5,210 square feet of space. The foundation of Building 13B also was finished before construction stopped. The base is the top of the parking garage for the Viceroy. As approved, this condo tower would rise to 87 feet above finished grade and contain 83,613 square feet of space — all of it designated for 72 condo/hotel units. Related’s first “baby steps” in the restart were seen this winter in suspended Building 7, designed as the arrival center for the entire project. Upgrades to the entry area and some modifications cost the developer between $600,000 and $700,000. The transit center sits directly at the end of the bridge built on lower Wood Road. It’s approved to be built with 29,474 square feet of space, with 18,449 square feet of residential space across 10 units. Its highest point was approved at 87.5 feet. According to Oz Architecture, Buildings 4A and 4B and Building 6 were fully designed and ready for building permits when work on the project stopped. Buildings 4A and 4B are to be located behind the base terminal of the Elk Camp Gondola building in the village center. At a maximum height of 54 feet, they include 13,116 square feet of total space and have four residential units above retail spaces. Also good to go was Building 6, just behind Building 7. It includes 17,177 square feet of total space, with 14,622 square feet of residential space across nine units. 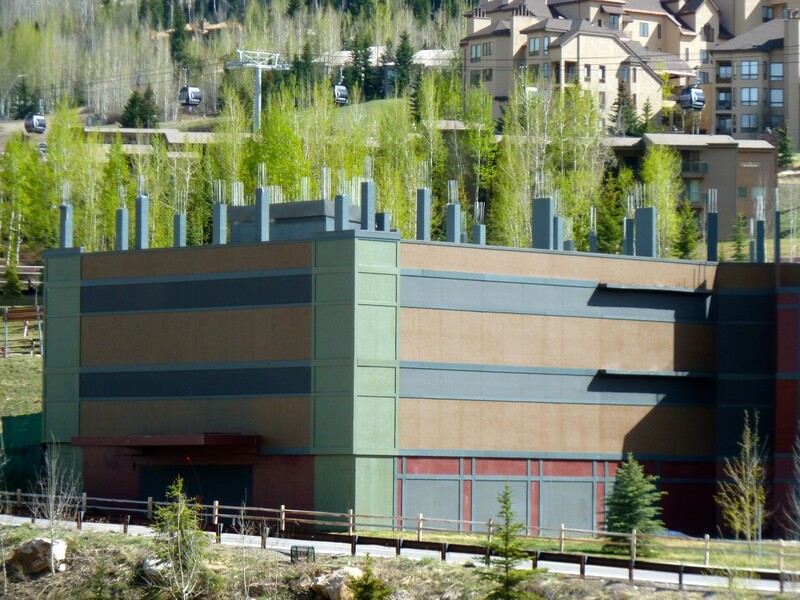 Design work was under way on Building 5, which is located on the roof of the parking garage next to the ski trail that connects Assay Hill to Fanny Hill. At 75 feet tall, Building 5 includes 92,123 square feet, of which 86,205 square feet was needed for 57 condo units. The building was meant to be one of the main gateways to the core of the village from the parking garage. It also was viewed as a Little Nell Residences project. In the center of Base Village, buildings 9A and 9B would offer a total of 2,512 square feet. There are also some very big buildings that have been approved, but not designed, for Base Village. Buildings 10A and 10B, across from the Enclave, are side-by-side. The tallest point of the two is at 96 feet. Together they account for 118,570 square feet — all of which is to be used to build 90 residential units. Building 11, across Wood Road from the Viceroy, is to top out at 87 feet and have 50 condos across 63,570 square feet. Building 12 — higher up Assay Hill than the Viceroy — is 74.5 feet high with 41 units taking up 55,435 square feet of space. Also in the conceptual stage is a 3,500-square-foot Aqua Center building. Off to the side of the project are the conceptual Fanny Hill townhomes, which include 11 residential units adding up to 24,425 square feet. Aspen Journalism collaborated on this story with The Aspen Times and the Snowmass Sun. The Times published a version of the story on Wednesday, June 26, 2013, as did the Sun. No Little Nell hotel for Snowmass Base Village? Terrific reporting, editing, simultaneous placement and teamwork! Just got a chance to read the new piece by Madeleine.